I couldn’t see. History was about to be made and I was going to miss it. 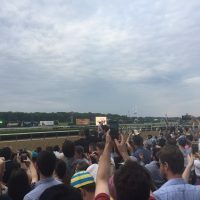 In front of me was a sea of people standing on benches, shoulders, and tiptoes to get a glance of Justify leading a pack of nine other horses around the final turn in the Belmont Stakes. 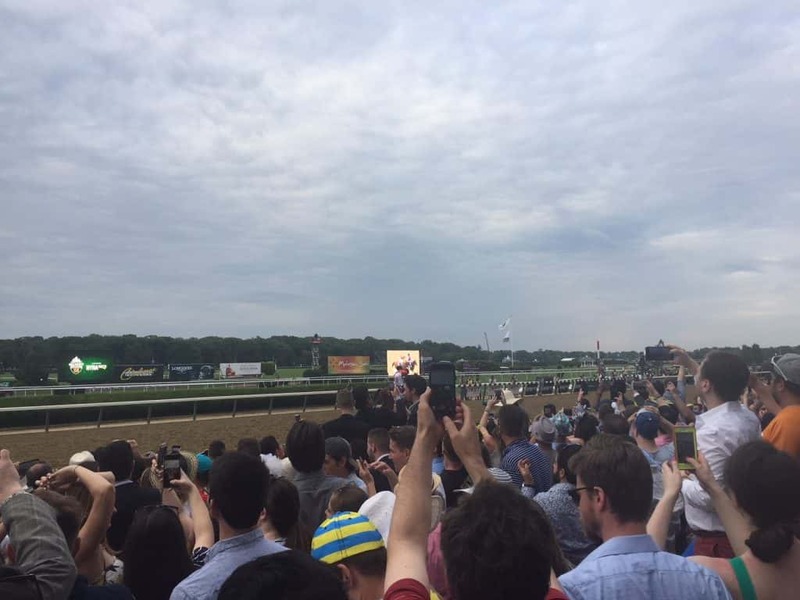 On the line was a chance for Justify to be the 13th Triple Crown winning horse in history, and all I could see was the back of the head of the person in front of me. It was 6:45pm, and it had been a long day up until that point. Getting to the race track at 1:30pm allowed time to walk around and survey the scene of brightly colored costumes people wore to the race. It seemed as if there was an unsaid rule of Belmont fashion in place; there were oversized hats, pink dresses, and bright red suits. It looked as if the creators of My Little Pony had personally styled everyone’s outfit color. One man even donned a banana suit. This wasn’t a costume, it was a literal formal suit that was light blue with yellow bananas on it. Wading through the people to buy a $10 foot-long hot dog certainly wasn’t the highlight of the trip, but seeing the long lines form in front of a cigar booth and the betting machines was a spectacle. The air on the track was hot and sticky, as the sun assaulted everyone with a dangerous heat. It made standing in the general admission section hard to do for a long period of time. But the heat, long lines, and high prices were all forgotten every time the trumpets sounded signaling the start of a new race. Then, the hot, sticky air became shocked with a new energy and people flooded into the main seating section to watch one of the 13 races that took place that day. There was palpable anticipation as the horses trotted into the stables and waited to be released, and a rising scream as they got set to cross the finish line, possibly making money for some, and losing it for others. So riding the wave of races throughout the day was what really kept us going for those next five hours. 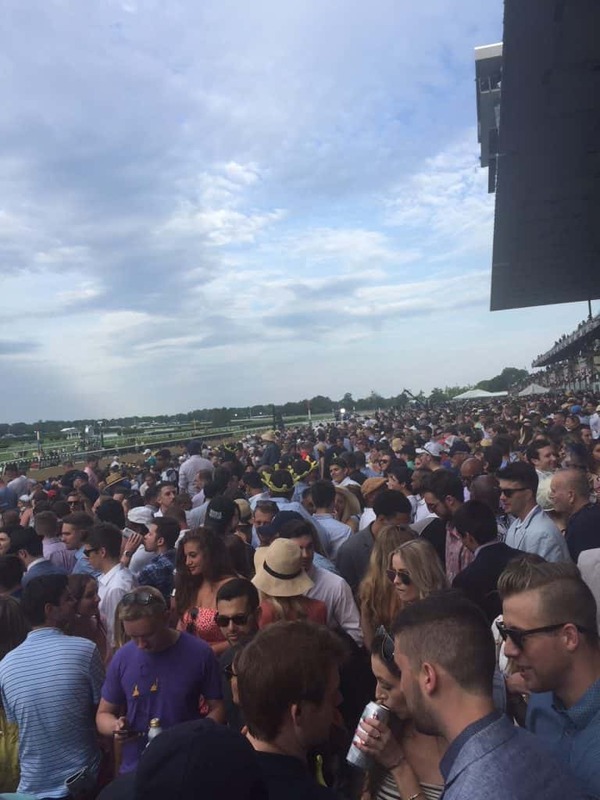 When the Belmont Stakes was about to get started, the energy that had appeared before every race was tenfold for this one, with people packing into the now standing room only section by the track. The pomp and circumstance–which, let’s face it, is half the reason people like big horse races–was on full display when two fighter jets flew over the 90,000+ attendees during the National Anthem. And then came the horse introductions, which seemed silly at first, but once Justify stepped his horseshoes onto the track, changed to admiration as every camera lens focused on him. The riders gave the horses some time to warm up to the track and then they got ready to go. You know in the movies when there’s a big moment and everything slows down? Like, you get to see all the action completely and can even almost see when something is going to happen and it’s all really graceful and artistic? Well, this moment was not like that. The moment all horses were in the stable, the gates opened and they were off, disappearing from sight through the first turn in a matter of seconds. In fact, the first quarter mile was about 23 seconds, which is considered on the fast side of quarter miles for a horse race of that length. Anyway, as the horses were on the far side of the track, I realized then my vantage point was blocked. Some people sat on others’ shoulders, others had climbed to stand on the benches. A girl next to me had stood on a garbage can to get a better view. It was chaotic, and when I looked up, the horses were almost at the final turn. So, I got on my tiptoes, yanked my phone out of my pocket and started filming. 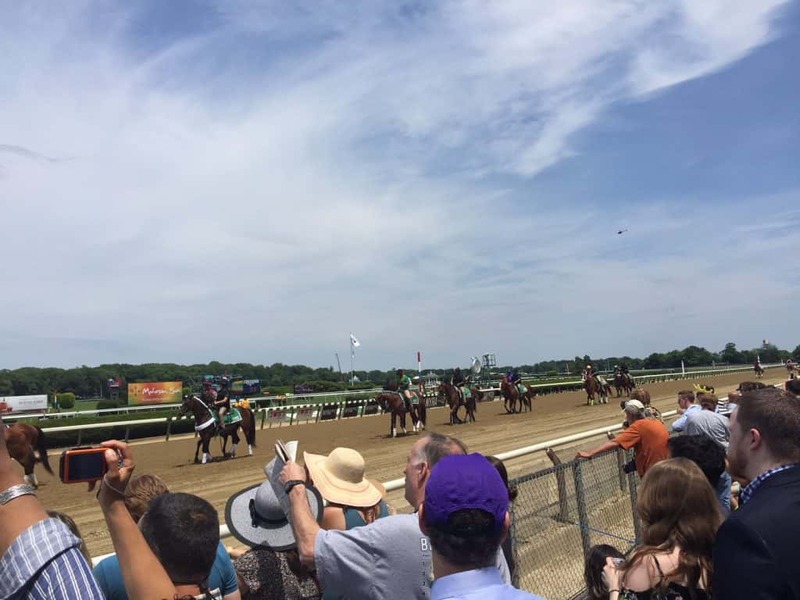 My hand length allowed me to see the horses go by through my phone, but I could’ve been blind and knew who won. Now, not to brag, but I’ve been to a good amount of loud sporting events, but watching Justify cross the finish line to win the second Triple Crown in four years was about as loud as I’ve ever heard it at an event. Hats were thrown in the air, beer and soda were thrown and sprayed everywhere. People jumped around. Strangers hugged, and some sat in disbelief. It was a moment that doesn’t come by often, and it lived up to its place in history.